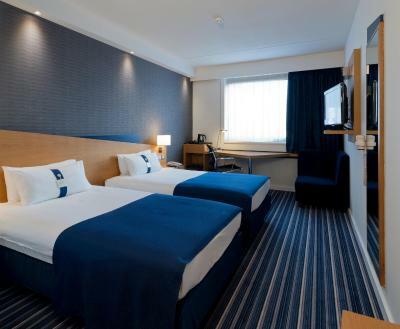 Lock in a great price for Holiday Inn Express Antwerpen City North – rated 8 by recent guests! Service is very good. Room is clean. Price is normal. We were going to a concert at the Lotto Arena. This location was perfect with parking and breakfast. I really liked the pillows...so comfy. The bed was a little narrow for 2 persons but it worked out ok. Lieve - the front desk manager was very helpful and offered us really good guidance with public transport - apparently its free with the concert tickets!! 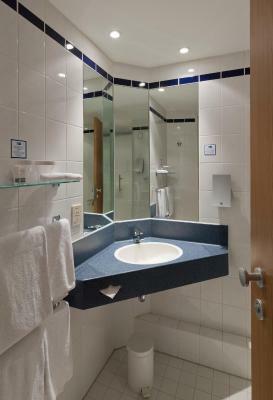 The hotel is located more or less 20min walk from the city center and a bit further away from the central train station, but there are several buses that can take you close enough to the hotel from there. The room was spacious enough for two and the bed was comfortable. The staff was friendly and the communication with them was always polite and timely. Breakfast (included in the price of the room) was good, with a buffet including coffee or thee, cereals, bread, yogurt, fruit, ham and cheese. It looked like a busy Sunday morning around 9am, but there was in any case plenty of space for everybody. There's a building being demolished* at the back of the hotel which opens up an amazing view of the harbour - bonus! ;-) * not noisy, great double glazing! Location is very good, breakfast was not bad as well bad, stuff (Xiomara if i recall right) was very friendly and helpful, parking is good. Great location by the marina. Close to the MAS and lots of great restaurants! There is a Velo stand at the back of the hotel that makes going around Antwerp by bike very easy. Staff was very friendly and helpful. Room was clear and comfortable, bed was perfect. Free wifi in hotels is usually pretty bad but was actually quite good in this hotel! 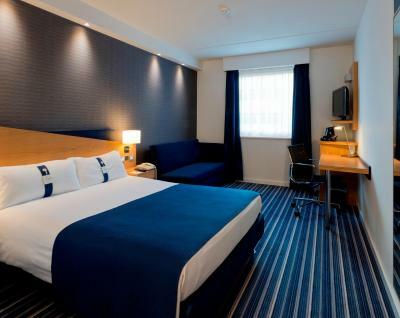 When would you like to stay at Holiday Inn Express Antwerpen City North? Please note that no extra beds or baby cots are available in this room type. Please let the hotel know the exact number of guests staying in this room. 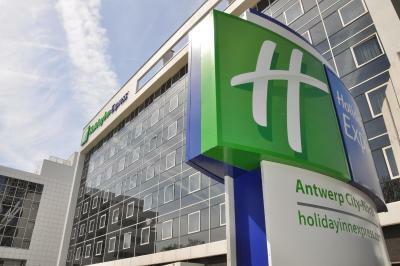 Holiday Inn Express Antwerpen City North is part of PREM Group. Established in 1996, PREM Group is a fully owned Irish company in the business of operating over 35 hotels and serviced apartments across Ireland, the UK and Europe. For Europe head office is located in Gent under the name PREM Group Benelux & France Division. The number one priority within each one of our hotels is our personal service towards our guests as well as our customer care. Hotel surroundings – This neighborhood is a great choice for travelers interested in atmosphere, city walks and cafes – Check location Good location – show map Guests loved walking around the neighborhood! 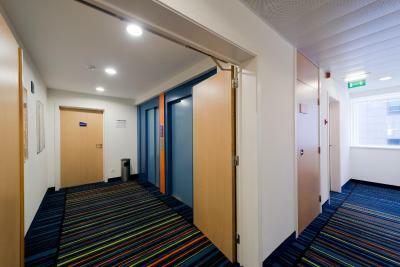 House Rules Holiday Inn Express Antwerpen City North takes special requests – add in the next step! 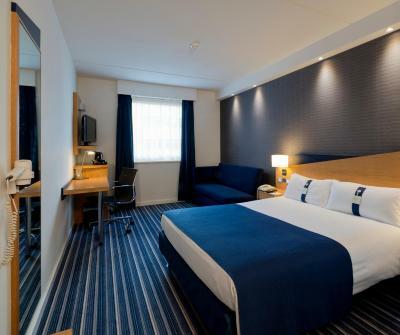 Holiday Inn Express Antwerpen City North accepts these cards and reserves the right to temporarily hold an amount prior to arrival. The kids bed was pretty bad. Even though we had mentioned that we were 4 guests, we only had 2 tea bags and 2 milk pots. There was only 1 pillow for kids. They had provided single duvet for both of them. The bed was pretty bad. The location was good and receptionist Manu was very good and she was really helpful in reserving a table at an Italian restaurant. Bit of a construction site all around the area. The waffles at breakfast were yummy! Annoyed to receive an email in ?Flemish from IHG hotels shortly after our stay which I (obviously) couldn’t understand. It seemed that the only way to unsubscribe from future emails required me to put in all my details to join their rewards system before I could ‘update my preferences’. I have finally tracked down a telephone number for the group and will be giving them a piece of my mind! I shall now try to avoid Holiday Inn and other hotels in the IHG group. 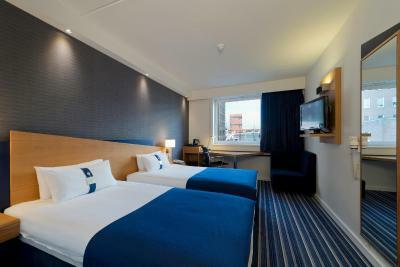 Comfortable, modern hotel in fairly good position for walking to the central areas of Antwerp. Staff very pleasant and helpful. Good location, great and delicious breakfast. Wi - fi is great ! Hotel is great and for business people, and for families with children... One day we go by car to the center, and tomorrow by walk.. maybe 8-10 min walking .. it is near.. The check-in procedure was a complete mess. Check-in time 3 pm, but the personal wanted to explain that it means from 3 pm. At the end the room were not ready and clean. Location of the hotel was perfect. The breakfast was very good and everything is avaible. Attentive staff and located in a nice area. It's about a 15 minute walk to the city centre. The docklands area nearby has a great variety of bars and restaurants. Would gladly return. The hotel is far from the city centre, making it a long way to walk to get food and to see the sights. Clean, quite and inviting hotel with friendly staff. Good value for money and a nice breakfast. I had to leave early to catch my train, but the staff organized me an early breakfast to go. Quite a walk from center but accessible. Breakfast is not good: sandwiches and waffles. Only boiled eggs. There was an air lock when using the shower "Screaming coming from water pipes" Regarding breakfast - didn't really cater for English people.